The Wonder Woman film has been a long time in coming, and honestly, that may have worked in its favor. In 1975, the thinking on how to do superhero stories in live action was still very much the Adam West Batman approach, and while the Wonder Woman television series starring Lynda Carter may have been a pop culture classic, and even a breakthrough for its time, the campier aspects of it were difficult for the popular consciousness to shake off. A few years later, when Superman: The Movie made Hollywood take superheroes seriously, it did so with a female lead that could barely do anything for herself apart from getting into stupidly dangerous situations and looking on adoringly when she was rescued by her man. Though the TV series did switch to a more modern setting when it switched networks in season two, reboots simply weren't done on a weekly basis like they are today, and as such, our heroine's story remained untouched for some time. At the time of Tim Burton or even Christopher Nolan's takes on Batman, any version of Wonder Woman would have likely strayed too far from the source material in order to fit a darker and more serious tone. But now, with the Marvel boom, it's the right time, and despite her appearance in Batman v. Superman: Dawn of Justice and the upcoming Justice League, make no mistake: Captain America and Thor paved the way for Wonder Woman to hit the big screen in her full glory, and this picture owes more than a little to both. In terms of tone, it also owes something to Disney films ranging from The Little Mermaid to Hercules, albeit less overtly. Diana (Gal Gadot), Princess of the Amazons, is raised on a sheltered island paradise called Themysiscira, and trained as a warrior against the wishes of her mother, Hippolyta (Connie Neilsen), who wants to protect her from the dangers of the outside world and from a dark secret. But when an American pilot and spy named Steve Trevor (Chris Pine) crashes near the island, bringing World War I to their doorstep, Diana learns of the raging conflict that envelops humanity. Believing the Great War to be the work of Ares, the supposedly banished God of War, Diana decides that she can end the conflict by leaving the island and tracking down Ares, using a powerful sword known as "The Godkiller" that was entrusted to the Amazons. Diana leaves her home for the first time ever, accompanying Steve back to London and eventually to the front lines. As Diana fights among men, she sees mankind at its best and worst, and uncovers her true destiny along the way. This is a flat out great movie, hitting every note you'd expect from a superhero flick, and a few new ones, though it does stay very close to formula. There is nothing in terms of story structure or visuals that is ground breaking (in fact, producer Zack Snyder has infused a good deal of his 300 signature style into much of the action, as well as the origin flashbacks.). But what is refreshingly new is the attitude: director Patty Jenkins approaches the material with an earnest and heartfelt respect, unwavering and unapologetic about its feminist ideology without ever letting the movie become bogged down by an inflated sense self importance (and it most certainly is important, and it comes at a crucial time.). There is something so genuine about the character and her struggle to understand the man's world and her lack of desire to assimilate or to be ruled by their silly ideas. The metaphor may seem obvious, but it never feels forced or preachy. It's also refreshing that Jenkins never allows the camera to ogle Diana in the way most action films do with their female characters, or like male stars like Chris Hemsworth, Hugh Jackman or Ryan Reynolds get shamelessly ogled in their superhero films. This movie not only needed to be directed by a woman, but by one who was deeply committed to the heart and soul of the material, and that is another reason why the long wait was worth it. While Gal Gadot was easily the best part of Batman v. Superman: Dawn of Justice, that's a bit like being touted as the most pleasant aspect of diarrhea, and it barely gave us an inkling of what she could deliver with the guidance of a true actor's director (Jenkins directed Charlize Theron to an Oscar for Monster). Gadot has a dramatic intensity that is matched only by her endearing light comic flare, and it is truly a star making performance, She is more than ably assisted by Chris Pine, who may be the funniest leading man of his generation, and one of the few at his level who would happily take on the task of playing the not so super love interest in a superhero movie. Steve Trevor can be a likable character or a remarkably dull one, but Pine's take on him vaguely recalls Diego Luna's Cassian Andor if he were played by John Ritter. 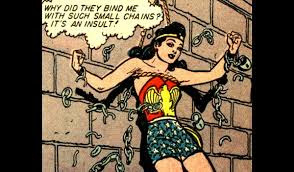 The choice to give Steve some Liar, Liar style moments with the lasso of truth was a stroke of comic relief genius, but the way Diana's idealism makes him question his own guilt as part of the darker side of humanity is far more compelling than the overwrought attempts at drama DC has been giving us of late. Pine can carry a movie like this on his own, but he and Jenkins never lose sight of the the fact that the title is Wonder Woman for a reason. The rest of the supporting cast fit into place perfectly, with Ewen Bremner and especially Saïd Taghmaoui (an actor I've admired since his smoldering interrogation of Mark Wahlberg in Three Kings) standing out, along with David Thewlis as a British military man. Connie Nielsen and Robin Wright make only brief appearances, but add a strength of presence that really sells us on the world Diana comes from before she becomes Wonder Woman (I could have watched an whole movie based around Wright's character, Antiope.). But perhaps the best is Lucy Davis (Dawn from the original version of The Office) as Steve's secretary, Etta Candy. By allowing Etta to be a part of the team in her own way and so completely trusted by Steve and Diana, the filmmakers make a quiet and subtle statement that even that strong woman have existed at all times and in all places, and they don't all have to be gorgeous amazon warrior princesses. There is definitely a crowd out there trying to sell the narrative that the film is only being received so well in comparison to the other DC Extended Universe films, and there's no question that the comparison to the troubled earlier efforts helps, but this is up there with the best efforts of Marvel Studios and the other standouts that came before. It may not be as emotionally wrenching as Logan or as hip as Deadpool, but Wonder Woman is a smart, thrilling, meaningful and often hilarious movie for all (or at least most) audiences that combines the epic feel of the best DC with the heart and humor of Marvel, and it aims to inspire a generation of girls and boys to look beyond stereotypes of heroism and strength, and make the rest of us remember our simple youthful ideals. It's a terrific movie that give good reason to have hope for the future of the DCEU, and it may be the most fun blockbuster you will see this summer. In short, to paraphrase the ultimate comic book movie tag line, you will believe a woman can fly as high as any man.